WardsAuto announced the winners of the annual Wards 10 Best Engines award program on Dec. 14. 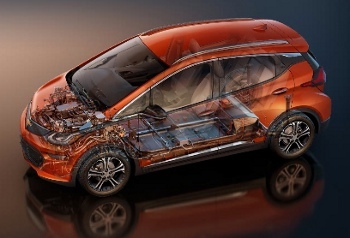 For the first time, four electrified powertrains (including one fuel cell) have made the cut to be included alongside traditional, gasoline-powered internal combustion engines. The 150-kW Electric Propulsion System in the Chevrolet Bolt was one of four electric vehicle powertrains named to Wards 10 Best Engines 2018 list. The new list is also notable for the absence of winners from German automakers, which is a first in the award's 24-year history. And while luxury brands are typically well represented on the Wards 10 Best Engines list each year, only two -- Infiniti and Jaguar -- made the cut for 2018. "We're thrilled to see so many high-volume automakers whose vehicles are more affordable for average Americans delivering truly outstanding powertrains," said Drew Winter, WardsAuto's senior content director. Winter added that the jury didn't set out to find this many electrified drivetrains to honor this year, but the four that made it "belong on our list because they are extremely efficient while at the same time fun to drive." Since 1995, the Wards 10 Best Engines competition has recognized outstanding engines and electrified propulsion systems, as well as the technology and engineering behind them. All new or significantly improved powertrains, as well as last year's 10 returning winners, were eligible. Vehicles must have a base price no higher than $63,000. Editors score each powertrain based on horsepower, torque, comparative specs, noise attenuation, observed fuel economy, and the application of new technology. You can read the unabridged version of this article here.